Caroline Henze-Gongola is a doctoral student in the Department of English. Her interests include American poetry (postbellum to present), pedagogy, history of the book, and media studies. She is currently pursuing her graduate certificate in the Cinema Studies program. 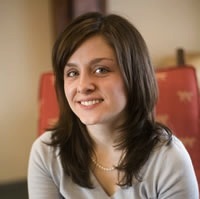 In April 2011, she and a colleague in History and Sociology of Science received the GAPSA-Provost Award for Interdisciplinary Innovation for a reception history on 19th- and 20th-century medical handbooks: "How to Succeed in Medicine a Century Ago: The Legacies of D. W. Cathell’s Physician Advice Manual." She has served on the Graduate English Association as a first-year representative, School of Arts and Sciences representative, and graduate computer lab liaison. Before her studies at Penn, she volunteered as a Title I reading tutor and team leader for AmeriCorps in Richmond, Virginia. She has also worked as a freelance copyeditor and proofreader.